Galactus was originally the explorer Galan from the planet Taa, which existed in the pre-Big Bang universe. When a cataclysm gradually kills all other life in his universe, he and other survivors leave Taa on a spacecraft and are engulfed in the Big Crunch. Galan does not die, however; he is transformed by bonding with the Sentience of the Universe. He gestates for billions of years in the universe which formed after the Big Bang, emerging as Galactus. A Watcher (Ecce) sees Galactus' birth; although he recognizes his destructive nature, he chooses not to kill him. Fully awake, Galactus is so hungry that he consumes the nearby planet of Archeopia. This planet is the firs of many, since Galactus must consume their life energy for sustenance. In memory of his dead home world Taa and the first planet to fall prey to his hunger, Galactus constructs a new "home world" (Taa II). He later becomes involved in a civil war among the Proemial Gods, who came into being during the universe's infancy as caretakers of the cosmic balance. After a faction of the gods (led by Diableri of Chaos) tries to remake the universe in their image, Galactus kills Diableri and imprisons two other rebel gods (Tenebrous and Aegis) in the Kyln. 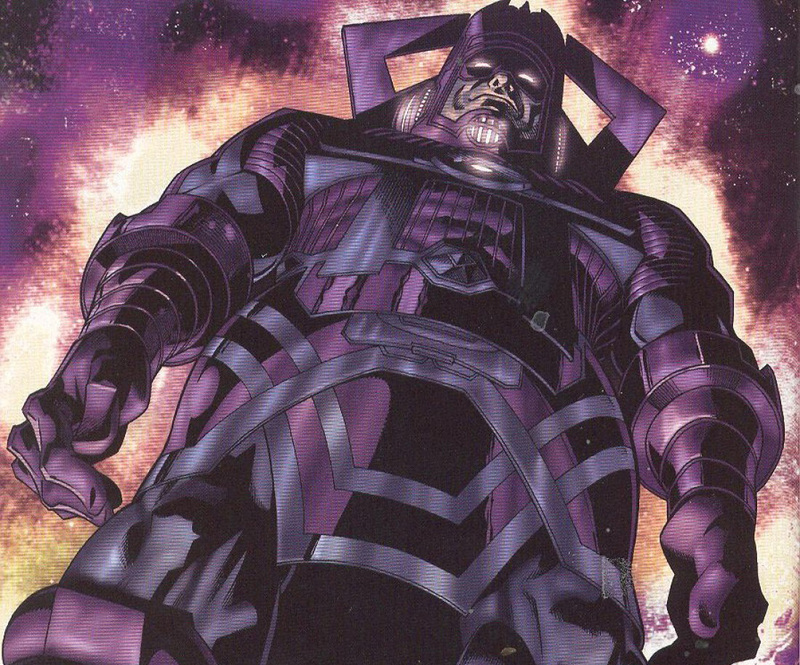 Galactus is driven to create a being in his own image, Tyrant; Tyrant rebels, and after a battle they part. Galactus decides to empower others as heralds to find worlds for him. Unhappy with his first herald, the Fallen One, he dismisses him and later recruits Norrin Radd as the Silver Surfer. After making his way to Earth, Galactus is defeated by the Fantastic Four, Uatu the Watcher and the rebellious Silver Surfer after they retrieve the Ultimate Nullifier from Galactus' possession. Galactus leaves Earth, vowing that he will never try to consume it again; however, he relegates the Silver Surfer there for betraying him. He later returns for his former herald, but the Surfer is unrepentant and chooses to remain on Earth. Thor sees Galactus when the entity is in conflict with Ego the Living Planet, and discovers his origin. Returning to Earth, Galactus again tries to re-enlist the Silver Surfer. The Fantastic Four and the Surfer defeat Galactus' herald, Air-Walker; Mr. Fantastic reprograms Galactus's ship to travel to the Negative Zone, said to contain many uninhabited worlds to consume. Thor and Olympian ally Hercules see Galactus when his next herald, Firelord, travels to Earth to be free of his master. Galactus frees Firelord when Thor presents Galactus with the Asgardian Destroyer to animate and use as a herald. Galactus conflicts with the High Evolutionary when he tries to devour Counter-Earth, but he is transformed into harmless energy after attempting to devour the planet Poppup. Returning to his normal form, Galactus is sought by the Fantastic Four to help stop a new cosmic threat (the Sphinx). Mr. Fantastic offers to release Galactus from his vow to avoid Earth if he helps defeat the Sphinx. Galactus agrees, if the Fantastic Four recruit Terrax as a new herald. The heroes succeed, and the newly-empowered Terrax leads his master to Earth. Galactus finds the Sphinx in Egypt, defeats him and retreats when Mr. Fantastic threatens to use a fake Ultimate Nullifier. Galactus is fooled by the Galadorian space knight Rom into trying to devour the Black Nebula, home of the Dire Wraiths. The devourer is repelled by the Wraith Sun weakened, he pursues the rebellious Terrax to Earth and strips him of power. Galactus is saved by the Fantastic Four and the Avengers and acquires another herald, Nova. He destroys the Skrull homeworld, and discusses his role in the universe with fellow cosmic entity Death. Mr. Fantastic is captured for saving Galactus' life, and is tried by aliens who are remnants of races annihilated by Galactus' hunger. During the trial the cosmic entity Eternity—the sentience of the Marvel Universe—intervenes, allowing all present to momentarily become one with the universe. This lets them understand that Galactus is part of the cosmic order, despite the loss of whole races. After the encounter no one can remember why Galactus is necessary, but they know that he is. During the Secret Wars, Galactus tries to consume Battleworld to have his insatiable hunger taken away by the Beyonder but his plan is foiled by Dr. Doom. He grants clemency to the Surfer, who helps his former master against the Elders of the Universe and the In-Betweener's schemes. Galactus helps the cosmic hierarchy in a war against the mutant Eternal Thanos, who had the Infinity Gauntlet. When Nova is conscience-stricken at causing the death of billions of aliens Galactus takes on a new herald, the bloodthirsty Morg. Tyrant returns; despite capturing the Surfer, Morg and several other cosmic-powered aliens, he is thwarted by Thanos and destroyed when Morg uses the Ultimate Nullifier. Galactus decides, with help from new herald Red Shift, to only devour the energy of living beings; this brings him into conflict with alien races and Earth's heroes. During a final confrontation near the home world of the Shi'ar, the Silver Surfer turns Galactus' siphoning machines on him. Galactus starves and dies, taking the form of a star. The death of Galactus allows the entity Abraxas (a metaphysical embodiment of destruction, and the antithesis of cosmic entity Eternity) to emerge from imprisonment. He wreaks havoc across thousands of alternate universes, killing every incarnation of Galactus that he encounters. Abraxas is thwarted when the children of Reed Richards, Franklin Richards and Valeria Von Doom, exhaust their powers to restore Galactus; Mr. Fantastic uses the Ultimate Nullifier to reset reality, preventing Abraxas' escape and destruction. Conscience-stricken, Galactus tries to rid himself of his hunger by feeding on the power from the Infinity Gems but is tricked into releasing the Hunger, which feeds on entire universes. The creature's access is sealed, with Thanos' help. When an alien race develops a technology making planets invisible to Galactus, he empowers the Human Torch (who has traded powers with the Invisible Woman) as an unwilling herald to locate the planets. The Fantastic Four and Quasar are able to free the Torch by changing Galactus back into Galan. Galactus consumes Beta Ray Bill's Korbinite home world and reveals a new herald: Stardust. When the Negative Zone villain Annihilus launches a war on the universe, one of his first attacks destroys the Kyln and frees Tenebrous and Aegis. Sensing their release, Galactus temporarily releases Stardust from service and reemploys the Silver Surfer as his herald. Aegis and Tenebrous find and defeat the Silver Surfer and Galactus, delivering them to Annihilus. Annihilus binds Galactus, and plans to use his energy to destroy all life in the universe. Drax the Destroyer frees Galactus, and after Galactus teleports Drax to safety unleashes a blast which destroys most of Annihilus' forces. Galactus accepts Stardust as his herald again, with Silver Surfer. Seeking a final confrontation with Aegis and Tenebrous, Galactus sends the Silver Surfer to locate them. The Surfer finds them and engages them in battle, drawing Aegis and Tenebrous into the barrier between the universe and the Negative Zone (which destroys them). After an encounter with Epoch, Galactus consumes the planet Orbucen. He and Stardust again come into conflict with Beta Ray Bill when a distraught Bill seeks vengeance against Galactus for the destruction of the Korbinite home world. Feeling empathy for the only survivor of a destroyed planet, Galactus creates a female Korbinite for Bill. Galactus is drawn to the planet Sakaar and devours it, earning the enmity of Skaar and Hiro-Kala. Hiro-Kala poisons Galactus with the Old Power, a synthesized form of the Power Cosmic. The Silver Surfer finds the body of a future Galactus under New York City, and summons the present Galactus (who confronts Mr. Fantastic) to Earth. Mr. Fantastic explains that in the future, the heroes on a dying Earth had killed Galactus to escape to the present with time travel. When he discovers that those heroes live on a planet called Nu-Earth in the present, Galactus destroys it (and its inhabitants) in retribution. A tear in the fabric of space caused by the Annihilation Wave and other interstellar conflicts allows the extra-universal forces of the Cancerverse (a universe without death) to invade. Galactus, the Celestials and the resurrected Tenebrous and Aegis combat the powerful Cancerverse weapon, the Galactus Engine. In the "Chaos War" storyline Galactus is teleported to Earth by Hercules to help fight the Chaos King, a metaphysical embodiment of oblivion and another antithesis of Eternity. While Hulk and his allies (the God Squad, Alpha Flight and the surviving Dead Avengers) fight Amatsu-Mikaboshi's forces, Amadeus Cho and Galactus work on a machine which will move Earth to the sealed-off continuum. The Nova Corps was originally a space militia and exploration group for the planet Xandar. It consisted of 500 soldiers ranging in rank from Corpsman up to Centurion and its leader Centurion Nova Prime. The source of the Nova Corps power is called the Nova Force which is an unlimited energy generated by a living computer called the Xandarian Worldmind. The Nova Corps have two priorities: defend the Xandarian civilization and protect and safeguard the Xandarian Worldmind. The Nova Corps and Xandar were destroyed three times: once by the alien Zorr, once by the space pirate Nebula, and once by the Annihilation Wave. They also had a costly war with the Skrulls. During the Skrull's Secret Invasion of Earth, the Nova Corps were formed a fourth time to help Nova Prime Richard Rider defend the Project Pegasus building from the Skrulls. Their base of operations was inside Ego the Living Planet, rechristened "Nu-Xandar". During the Kree-Shi'ar War, the Xandarian Worldmind starts recruiting new members to the Nova Corps without telling Richard. Upon learning that Ego the Living Planet is one of the Nova Corps, Richard speaks against this to the Xandarian Worldmind. Richard is stripped of his rank and discharged from the Nova Corps. After most of the new recruits are slaughtered by the Shi'ar's Imperial Guard, Ego is discharged from the Nova Corps and Richard is reinstated. Afterwards, Richard agrees to train the remaining recruits, which also includes his younger brother Robert. During the war with the Cancerverse, Richard takes the Nova Force from the other recruits to use against Thanos. Richard apparently dies before returning it, leaving the Nova Corps powerless. When the Phoenix Force returns to Earth a new centurion named Sam Alexander arrives to help the Avengers stop it. The Nova Force is the source of power for Nova and the entire Nova Corps, generated and controlled by the Living Computers of Xandar called the Xandarian Worldmind. The amount of Nova Force a Nova Corp member can access is determined by their rank. The higher the rank, the more power they can access. It has been observed, such as the case of Garthan Saal, that some exposures to the Nova Force can induce madness and mental instability with prolonged exposure to extremely high levels. The Nova Force can grant the recipient (to varying degrees depending upon rank) various abilities including superhuman strength, speed, reflexes, and perception. It also grants flight at faster than light speed, a healing factor, and energy powers. These energy powers include the ability to create an electromagnetic beam or a gravimetric pulse. It can also be used to create Star Gates. The link to the Worldmind allows the wearer to access enemy profiles, analyze an attacker's strengths and weaknesses, interface with computers, analyze energy signatures, create shields against mental attacks and receive transmissions from nearby sources. Corpsman – The Corpsman are the entry level of the Nova Corps. Any graduates from the Space Academy must apply to the Nova Corps upon graduation. They have access to 25% of the Nova Force compared to the Centurions. They can lift approximately 5 tons with limited invulnerability. Like the Millennians, the Corpsman have small photon blasters in the armbands of the their uniform. Millennians – The Millennians have 50% of the Nova Force compared to the Centurians. They cannot fly, but they can pilot one-man sky flyers. Millennians can lift approximately 10 tons, have limited invulnerability, and have small photon blasters in the armbands of their uniform. Denarians – The Denarians are the middle tier of the Nova Corps. They have access to 75% of the Nova Force compared to the Centurions. The Denarians can lift approximately 15 tons.Centurion – The Centurions are the top tier of the Nova Corps. It is from the Centurions that the Centurion Nova Prime is selected. The Centurions can lift approximately 20 tons. Nova Prime – The Nova Centurion designated as 'Prime' is the highest-ranking member of the Nova Corps. The Nova Prime is endowed with a vast portion of the Nova-Force, and capable of great feats of energy manipulation and projection. Richard Rider- First Nova Corps member from Earth; Former Nova Prime; Sacrificed himself protecting out universe form the Cancerverse. Jesse Alexander- Former Nova Corpsman; Father to Nova Sam Alexander; being held prisoner on some unknown plant. Sam Alexander- Latest Nova Corpsman from Earth. In the aftermath of the Phalanx invasion of the Kree, Star-Lord decides to form a team of interstellar heroes that will be proactive in protecting the galaxy, rather than reacting to crises as they happen. To this end, he recruits Adam Warlock, Drax the Destroyer, Gamora, Phyla-Vell (the new Quasar), Rocket Raccoon, and Groot, with Mantis as support staff. On the recommendation of their ally, Nova, the group establishes a base of operations on the space station Knowhere, which possesses a teleportation system with near-universal range. An intelligent, telepathic dog named Cosmo is Knowhere's chief of security and works closely with the new team. After a confrontation with the Universal Church of Truth, the team meets a semi-amnesiac man who identifies himself as Vance Astro - Major Victory of the original Guardians of the Galaxy (from an alternate dimension) Astro's declaration inspires the as-yet-unnamed team to adopt the "Guardians of the Galaxy" name for their own. When the team learns Star-Lord directed Mantis to telepathically coerce the heroes into joining the team, they disband. Meanwhile Star-Lord was banished to the Negative Zone by Ronan the Accuser for his actions during the Phalanx's attempted conquest of the Kree Empire. There, he finds himself in the middle of King Blastaar's fight to break into 42 and use its portal to invade Earth. Star-Lord allies with Jack Flag to defend the prison and contact the other Guardians for rescue. Rocket's new team successfully brings both of them back, and Flag becomes a Guardian. Star-Lord, Mantis, Bug, Jack Flag, and Cosmo are taken to the 31st Century by that era's Guardians, who warn them of the creation of an all-destroying energy rift called The Fault at the war's conclusion. Trapped in the future, Star-Lord's team is able to get a message to Warlock in the 21st Century. Warlock is unable to stop The Fault's creation, but is able to contain it with a spell that requires a stable, unused timeline. Warlock chooses the one he previously erased, causing him to become the Magus. Star-Lord's team, with the help of Kang the Conqueror, are returned to this point in the timestream. To escape, Magus fakes the death of himself, Mantis, Cosmo, Major Victory, Martyr, and Gamora. Martyr(Phyla Vell) frees herself with the help of Maelstrom, and enables Mantis to call the other Guardians for help telepathically. When they come to the rescue, Phyla-Vell is misled by Maelstrom into freeing Thanos. Thanos kills Martyr, but is captured by the Guardians and taken back to Knowhere as a Prisoner. When the universe is invaded by the alternate universe, "Cancerverse," on the other side of the fault, the Guardians take Thanos to the Cancerverse in an attempt to end the war early. Along the way, Drax attacks Thanos and is killed. They are ultimately successful at ending the war, but Thanos is left enraged and promising to kill everyone. Along with Nova, Star-Lord remains in the collapsing Cancerverse as the other Guardians escape. After the death of Star-Lord, the Guardians disband. Still believing in their cause, Cosmo recruits another team under the name "Annihilators." Rocket Raccoon and Groot later reunite and decide to continue the Guardian's legacy after the duo prevent an incident on Rocket's home world, Halfworld. The team later appears on earth to help the Avengers against Thanos. Along with Groot, Rocket Raccoon and Gamora are a resurrected Drax and Star-Lord (who apparently escaped the Cancerverse). An Intergalactic religion who worship the Magus (Adam Warlock's evil persona) as the one true god. Their goal is to convert the entire universe or destroy those who do not. The Matriarch serves as the head of the church's (Magus) right hand while Black Knights enforce their doctrine and Grand Inquisitors handle their laws. Followers are fiercely devout to their religion and will do anything for their god. They are often very outspoken about the need for conversion to the Church. A division of S.H.I.E.L.D. that deals with off world threats to Earth. They are headquarted in Earth's orbit and the public generally has no knowledge of their existence. Only high ranking members within S.H.I.E.L.D. are aware of this branch. Many members of S.W.O.R.D. are themselves aliens. They are lead by Director Abigail Brand. Other members include Beast, Lockheed, Henry Peter Gyrich, Spider Woman, Carol Danvers and Sydren. After John Talbot, better known as Obelisk was defeated by the Avengers on the planet Kora and his forces sent to Earth defeated he fled into space. The Empire is vast, spanning an entire galaxy and possessing technology rivaling that of the Shi'ar, Kree, Skrull, and other majr universal powers. The Empire's military is vast, organized and well equipped. It is made up of volunteers, conscripts, and clones. 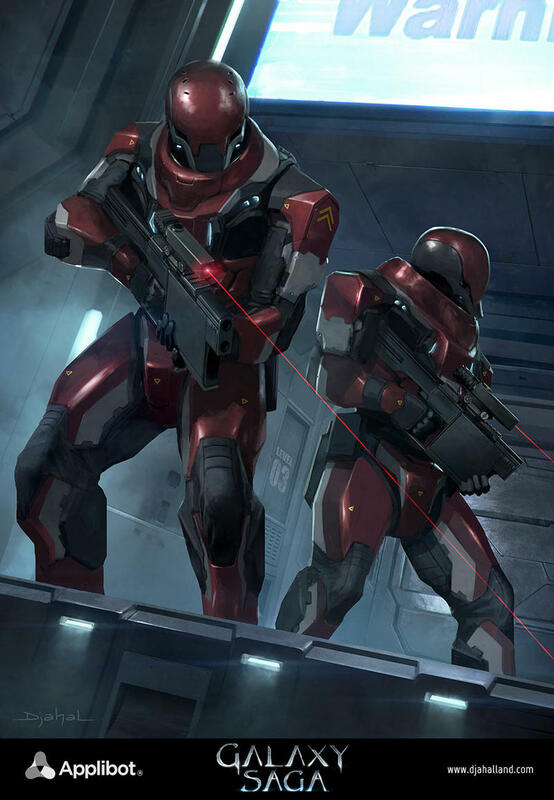 Crimson Legionnaires are some of the best trained soldiers in existence and they have marched over countless worlds and civilizations. The Primus-Class is a powerful type of warship, serving as the big guns within the Crimson Empire's vast starfleet is has enough firepower to turn a planet into slag and can take on several Shi'ar battlecruisers alone. While it's main guns are devastating it's most dangerous weapons are it's fighters and mechs it carries, carrying 100 fighters and 30 mechs. The Primus-Class is 1900 meters long. The Omega-Class is a newly designed ship brought into the fleet and mass produced on the newly crowned Emperor's orders. 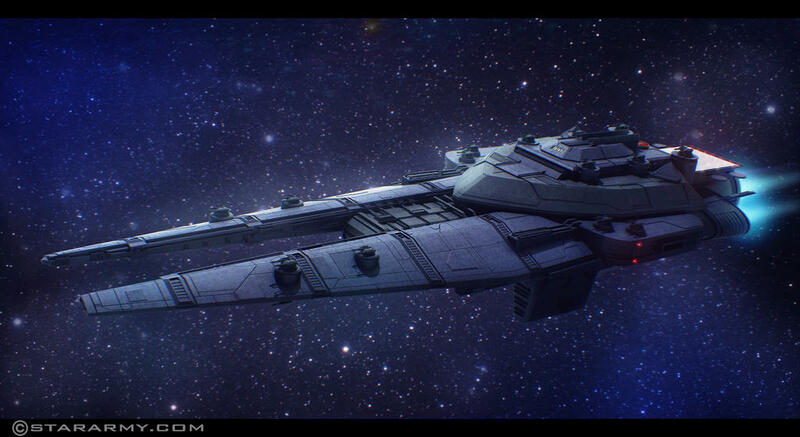 Designed to carry massive amounts of vehicles the Omega-Class is used to bring in fighters, mechs, and to deploy huge ground armies to target worlds. The Omega-Class is 2500 meters long. 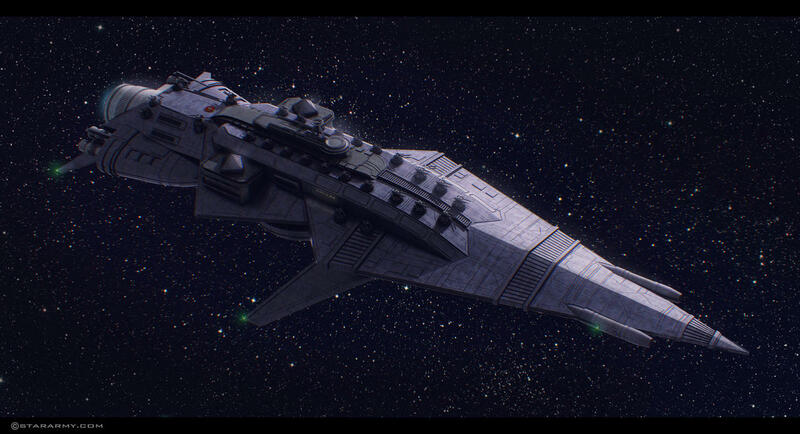 The Victus-Class is the most heavily mass produced warship in the Crimson Empire. Designed for ship-to-ship combat, patrol, interdiction, and fire support the Victus is the work horse of the Imperial Fleet. The Victus-Class is 950 meters long. 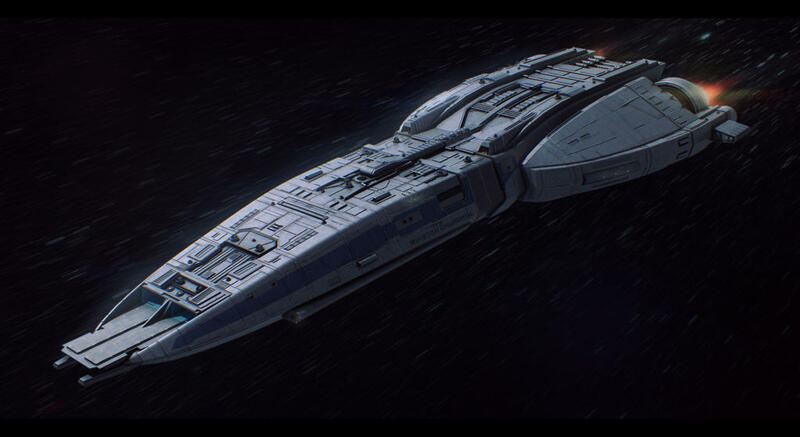 The Gauntlet-Class is a smaller warship with the sole purpose of taking down enemy fighters, running down smaller ships, and screening for larger ships. 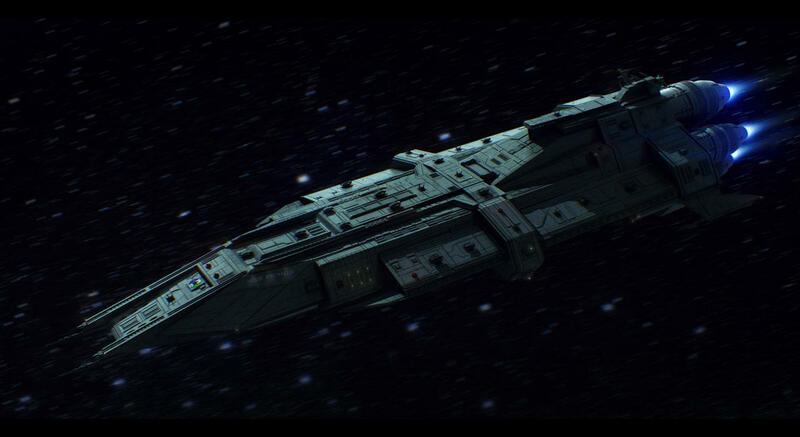 The Gauntlet-Class makes a very adept scout vessel and slaver ship as well for the Empire. The Gauntlet-Class is 500 meters in length. 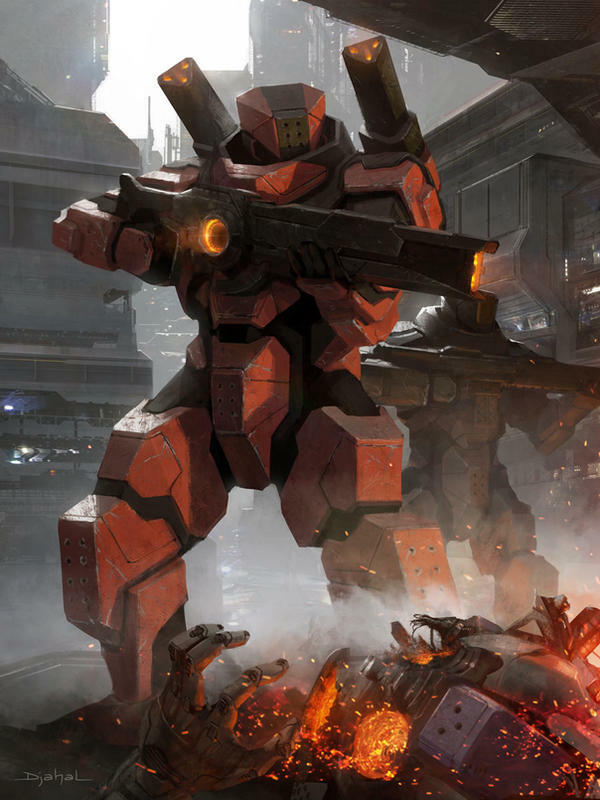 The "Wojek" is a very powerful war machine, a humanoid mech designed for both space and ground combat. It is extremely agile, heavily armored, and wields a powerful beam rifle, and some models are armed with shoulder mounted missile launchers. 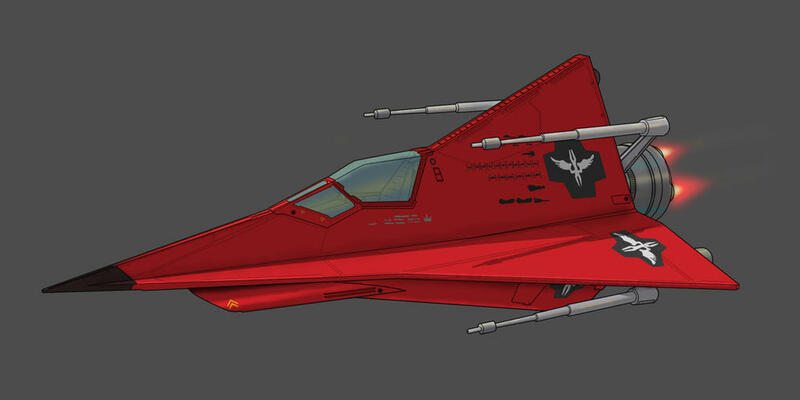 The Wojeks are superior to fighter craft and as such have become the face of the Crimson Empire as they wreck havoc against it's enemies. The Wojek stands at 17.5 meters in height. 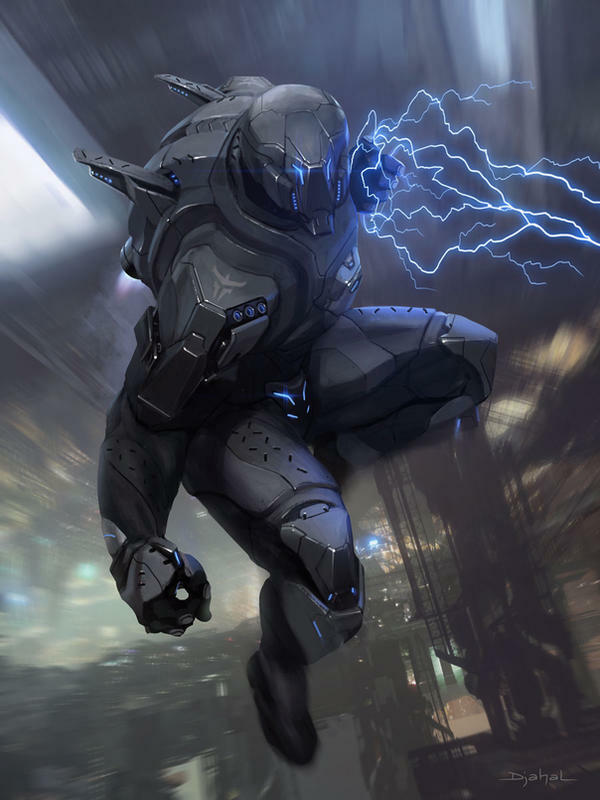 The Empire not only fields conventional soldiers wielding blasters but also fields warriors with metahuman powers. As many in the galaxy have developed mutant powers, the Crimson Empire was quick to adapt and add them to it's military ranks. Berserkers powers vary just as much as Mutants from Earth do. The faceless elite soldiers of the Empire. Armed with advanced energy weapons, wearing incredibly durable armor, and receiving some of the best training possible the Crimon Legions are the root of the Empire's might and preserve it's order and law throughout the Empire. A monstrous hulk of a machine, the Broadsword was designed to reign supreme on any battlefield, any terrain, and against any foe it might encounter. It is equipped with powerful weapon systems geared toward a variety of situations and targets, be they infantry, vehicles, or armor. However, with no dedicated anti-aircraft weaponry, it is somewhat vulnerable to air attack.. The "Tin Man" exo-suit is a infantry support platform designed to go where "Wojek" mechs cannot. 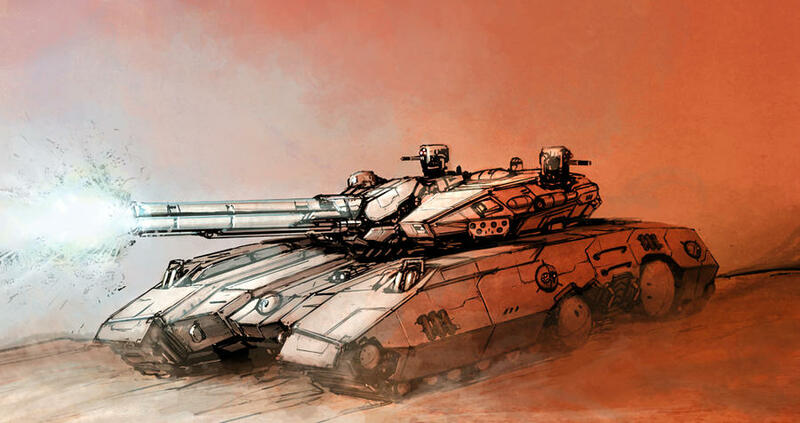 Standing just over 10 feet tall they are armed with powerful chain guns and missiles launchers. 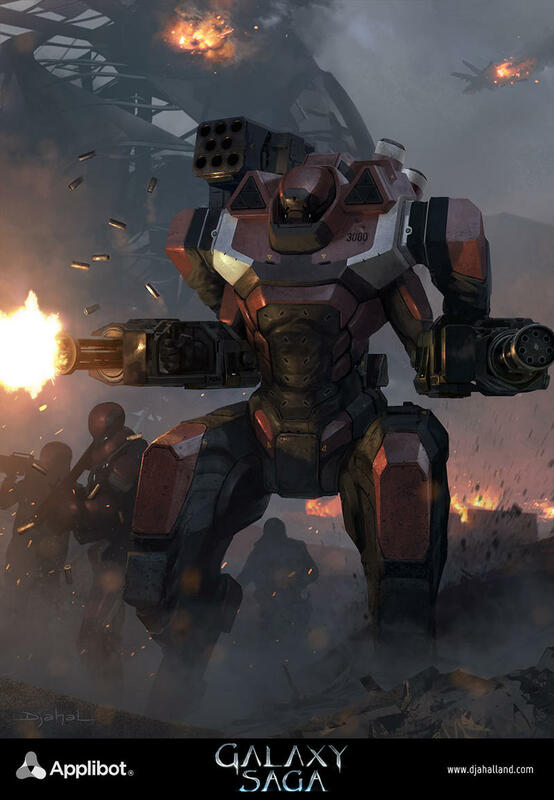 The Praetorians are designed as heavy assault dropships, carrying troops, tanks, mechs, and exo-suits into battle and bristling with weapons that emerge from the hull when in attack mode. Praetorians are the workhorse of the Imperial army.